We're conveniently located at 517 Broadway, right on the strip in downtown Wisconsin Dells! Paint It! is proud to offer only the highest-quality pottery & supplies, which are carefully selected from throughout the United States and Italy. 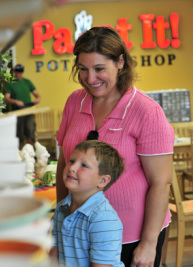 We have more than 400 pottery styles, over 70 paint colors, and a wide range of design center options. Get your introduction to the art of wheel throwing, and learn how to transform your project from mud to masterpiece. 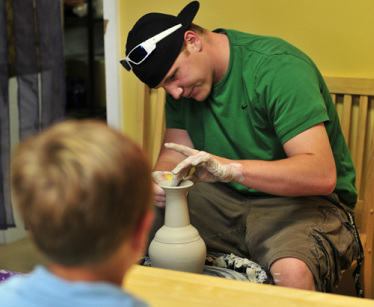 Our $36 fee includes all instruction, clay, glaze, and firing fees. Contact us today to schedule an appointment! Keep in mind when you do the wheel you piece will not be ready to paint and/or take home for a week after the wheel lesson. Paint It! is open year-round. Studio hours vary by season.